My dear darling boy. It's now 15 June 2013. You are 3! Although technically I did not have you until 21:30 (21:24 to be precise). I wonder, is 3 the landmark to be a boy, instead of a toddler? To be fair, you have always been a big tall boy, so people always think you are 4. It was hard explaining that you were only 2. It will be way way easier to say that you are 3. It won't be such a conversation stopper! Your thick shiny black STRAIGHT hair at birth all fell out a few weeks later, to be replaced by wispy curly brown hair LOL. In that car seat pic, you are about to leave the hospital and get in a car for the first time, to see home for the first time. That was taken Saturday 19th June and you were only 4 days old. When I sent that picture to all the family in Ireland, they said that looks like a 3 month old, not a newborn. It was SO hot that day, look you haven't even got socks on. I am not even sure if that is a baby gro, or literally just a vest. The all in one, with feet and hands that I paid £25 for from Mothercare, as a "leaving hospital" suit (coat thing) was SUCH a waste of money! I never got a moses basket, and thank God I didn't as you were such a long tall boy from the start. New born clothes? Don't make me laugh! You were STRAIGHT into 0-3 months and for the life of me, I can't remember how long they lasted. I wish I had documented those first few months (here on the blog) but although I was VERY active on Facebook and Netmums during that time, my blog, although already live, lay dormant for a few months - I ALWAYS regret that. So many memories I COULD have captured or to use the word I learned at Cybher: curated! Born at 9 pounds 10 oz, you were never ever small. During pregnancy I was classed as "large for dates" always measuring 2 extra centimeters on the length of my bump. The consultant who delivered you said "this one's ready for school" - I never ever want to forget things like that. The midwife was from Manchester. He was Nigerian, like all of Daddy's family. Anyway without further ado, HAPPY BIRTHDAY to my ONE AND ONLY. How wonderful to look back on such happy memories! I had a big boy too (induced at 39 weeks after a very rough pregnancy and he still came out weighing 9lbs 6oz... none of the midwives could believe it) and we have the same thing as you now, he is not yet 2 but people think he is at least a year older than he is! I guess big boys just keep on growing, hey? Awww, this really made me smile. I'm visiting from midlifesinglemum having seen your comments there. 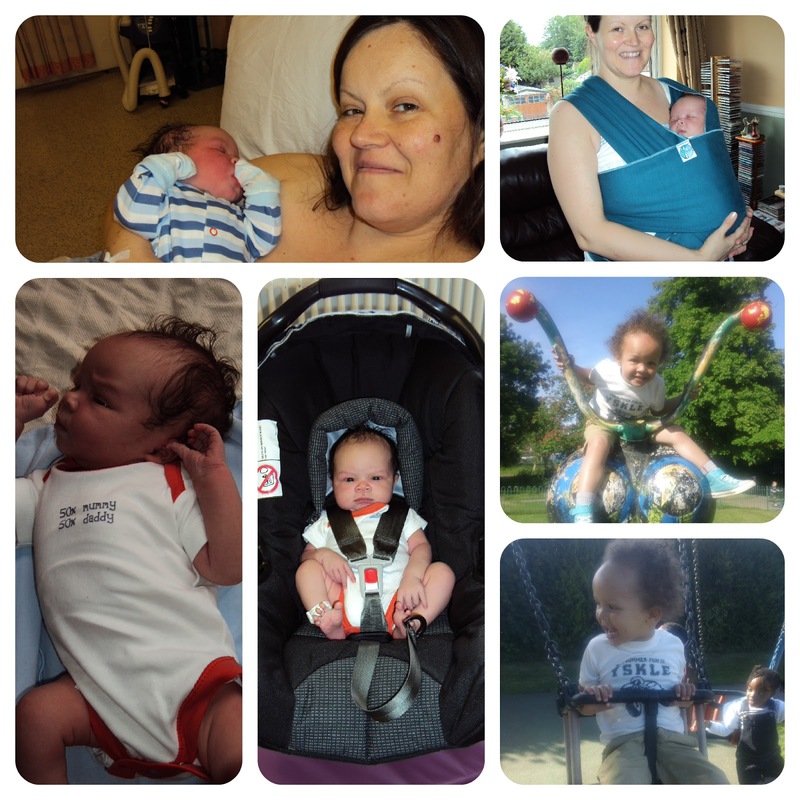 You have a gorgeous son and this is such a lovely collation of photos and memories. All the very best and hope you are enjoying a wonderful weekend. Happy birthday Big Boy! Love the photos.